North Lima Mennonite Church, 90 Mennonite Drive, will host an all-you-can-eat breakfast buffet from 7 to 10 a.m. for a donation. 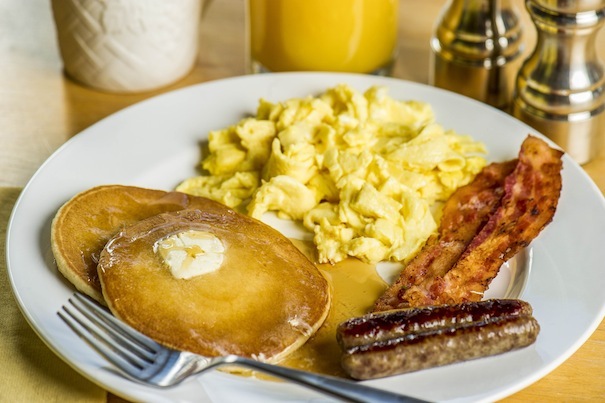 Menu includes eggs, pancakes, French toast, sausage, potatoes, homemade pastries, sausage gravy and biscuits, eggs with peppers and mushrooms, coffee, orange juice and beverages. For information, call the church at 330-549-2333. St. Thomas the Apostle Church, 4453 Warren-Sharon Road, Vienna, will host a spaghetti dinner and reverse raffle at 6 p.m. Tickets are $25 per person and are available at the church office and at the door. Doors open at 5:30. Centenary United Methodist Church, 1413 Belmont Ave., Youngstown, will host a free community luncheon at 12:30 p.m. Lunch includes sandwiches, chips, salad, dessert and beverages. All are welcome. Circle of Serbian Sisters of Holy Trinity Serbian Orthodox Church will sponsor a chicken paprikash dinner from 11:30 a.m. until sold out in the church hall at 54 Laird Ave. Meals will include dumplings, salad, dessert and coffee. Dinners are $11, and no pre-orders will be accepted. Meals are first-come, first-served. The dinner will take place in conjunction with the church's annual picnic that will feature barbecued lamb and pig and chevaps as well as homemade raised doughnuts and a variety of sandwiches. For information, call 330-792-1005. Canfield United Methodist Church, 27 S. Broad St., will host a "Summer Supper" from 5 to 6:30 p.m., rain or shine. Dinners will include sausage and pepper sandwiches, a variety of salads, fruit cobbler and refreshments. Dine-in or carry-out for a donation of $9. Sts. Peter and Paul Ukrainian Orthodox Church will sponsor a free neighborhood community dinner from 4:30 to 7 p.m. at the Orthodox Center, 1025 N. Belle Vista Ave., Youngstown. Aut Mori Grotto will host a benefit Swiss steak dinner at the Aut Mori Grotto Hall, 563 North Belle Vista Ave., Youngstown, from noon to 4 p.m. (or until sold out) Aug. 12. Cost is $10 per meal and takeouts are available. Menu includes Swiss steak, mashed potatoes with gravy, vegetable, rolls with butter, dessert, and hot or cold non-alcoholic beverages. Aut Mori Grotto is a nonprofit fraternal organization of master Masons that supports the following charities: dentistry for challenged children under 17, cerebral palsy, Akron Children's Hospital and Sojourner's House. For information on this event or Grotto charities, contact Gary Shane at 330-719-4714 or for information on joining this organization, contact Gary Farrant, secretary, at 330-519-1579. St. Lucy's Cultural Society will sponsor a takeout-only cavatelli dinner from 11 a.m. to 3 p.m. (or until sold out) Aug. 5 at the Palermo Center, 394 Tenney Ave., Campbell. Cost is $10 for adults and $5 for children. The menu also includes two homemade meatballs, salad, bread and dessert. Take containers or purchase the society’s for 50 cents each. VFW Post 2799 Auxiliary will sponsor a homestyle breakfast from 8 a.m. to noon Aug. 5 at the post home, 3161 E. South Range Road, New Springfield. Cost is $6 for adults and $3.50 for children under 12. The menu includes eggs, hash browns, sausage or ham, pancakes or freedom toast, toast and coffee or tea.